Identifying culprit foods that are triggering your symptoms can be tricky, which is why it’s important that you understand how FODMAPs behave and other potential causes. ​If you’re always looking at the last thing you ate, you might be quite confused by what is triggering your symptoms. FODMAPs usually take anywhere from 4 hours up to 24 hours to trigger Irritable Bowel Syndrome (IBS) type symptoms. This means it’s most likely an earlier meal that contained the problematic food. ​When we eat, food passes down the oesophagus and into the stomach. In the stomach it gets mixed with enzymes and broken down, before being slowly released into the small intestine. The average adults’ small intestine is about 6 meters long. As food passes through the small intestine it is further broken down to single molecules, so that nutrients can be absorbed through the wall of the intestine and into the blood stream. For one reason or another, FODMAPs do not get absorbed. This means they continue along the digestive tract to the large intestine or colon. During this process, two processes occur. As the FODMAPs pass along the digestive tract they draw water into the bowel, which may result in diarrhoea. When the FODMAPs arrive in the colon, they are fermented by the healthy bacteria that live there. This fermentation creates gas which causes bloating, excessive wind and pain. At any point in time, most people have about 24 hours’ worth of food at various points along their digestive tract. The human body is very smart, and when we eat messages are sent to the bowel telling it there is more food coming, and it needs to move things along to make room. If a FODMAP that was contained in an earlier meal, is then pushed into the large intestine, it potentially could cause IBS type symptoms soon after eating. In this case, it is a food eaten earlier in the day or the day before that is problematic, not the food that was just eaten. The gut brain axis is a very important part of IBS. This is a biochemical signaling system between the digestive tract and the central nervous system. These nerves also link to the emotional and cognitive centers of the brain, which is why stress, thought, emotion and psychological problems can affect gut sensation, triggering or worsening IBS symptoms. Its normal for people to feel butterflies in their stomach when they are nervous or anxious, in people with IBS, this is exacerbated and can actually trigger IBS symptoms, even when there are no FODMAPs present. FODMAPs are not the only type of food molecules that can trigger IBS type symptoms. 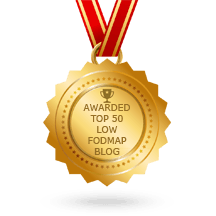 If you are reacting to low FODMAP foods or have unexplained symptoms, it may be worth troubleshooting with a gastro-intestinal expert dietitian to determine what is going on. The low FODMAP diet is proven to be effective for 3 out of 4 people who suffer with IBS type symptoms. If you are struggling to pinpoint your triggers or seem to be reacting to low FODMAP foods, keeping a food and symptom diary and troubleshooting with a dietitian who is experienced in this area, is likely to help you work out what is going on and the best way to manage it.